Last summer, I spent a week at the UK Scout HQ, Gilwell Park near London, for the YOTA event. 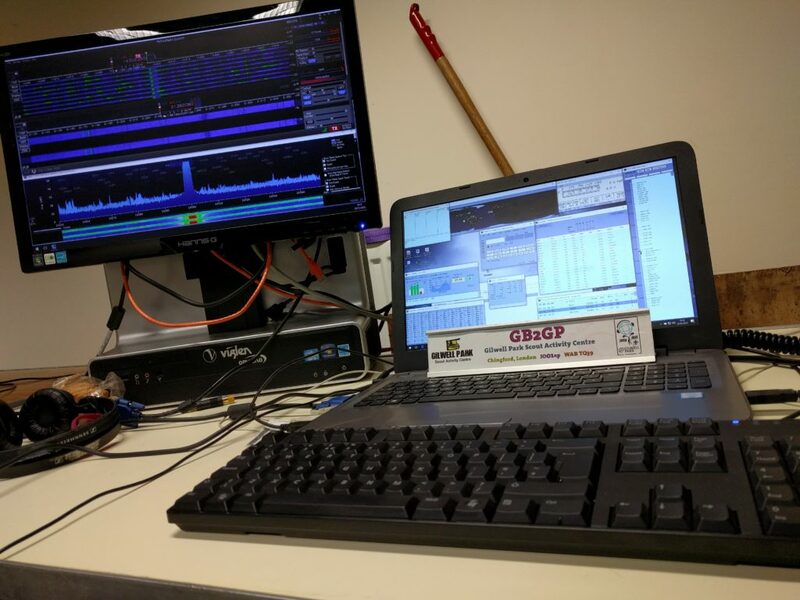 This weekend, I had the opportunity to return to the shack to help operate GB2GP – the permanent special event station for the Scouts – in the ARRL DX Contest. It was a really fun weekend, even if conditions were bad. It was so bad that at one point, once 40m closed on the morning, there was almost 2 hours with no QSO before 20m opened, during which I had just one QSO. There were very few times when more than one band once open to the US/Canada at once, but I did get a decent run on 15m on the Sunday lunchtime, which helped. We were entering in the multi-two category, as a tactical measure, but we actually operated with only one radio. This was my first time using a Flex SDR in earnest and I seemed to get used to it quite well. Also new for me was N1MM+, which also seemed to perform once I had got used to it (though I’ll probably stick with Win-Test / DXLog.net for most of my own contesting). The other novelty for me was this was my first contest using a Beverage antenna for the lower bands, and particularly 80m. This seemed to work really well, particularly given the amount of noise the transmitting antenna was subjected to, emanating from the nearby Brookmans Park broadcast transmitters. Final QSO total was just over 1000 QSOs. While that might not sound fantastic, being a training station, a large part of the focus was on having a mix of skills there, from a couple of us who were relatively experienced contesters, through to one person who hadn’t been on HF in years. Most importantly, I had a good time and it was great to work with a different group of enthusiastic people. Thanks to the GB2GP team for having me! March 5, 2018 in Amateur Radio, Contests. It was a pleasure having you at the station – you brought a wealth of experience with you, and seemed to take to the system almost as if you already knew how to run everything! It’s great to see your thoughts on this, and most importantly, great to see you had a good time! Hopefully we get better conditions for WPX.